In this painting from Odisha, Jagannath & Balabhadra are on a journey and are offered a drink of milk by milkmaid Manika. One of the most popular legends associated with Jagannath is that of Kanchi Avijana (or “Conquest of Kanchi also termed as “Kanchi-Kaveri”. According to the legends,the daughter of the King of Kanchi was betrothed to the Gajapati of Puri. When the Kanchi King witnessed the Gajapati King sweeping the area in front of where the chariots of Jagannath, Balabhadra and Subhadra were kept during Ratha yatra, he was aghast. Considering the act of sweeping unworthy of a King, the King of Kanchi declined the marriage proposal, refusing to marry his daughter to a ‘Sweeper’. Gajapati Purushottam Deva, felt deeply insulted at this and attacked the Kingdom of Kanchi to avenge his honour. His attack was unsuccessful and his army defeated by the Kanchi Army. On the road, Jagannath and Balabhadra grew thirsty and chanced upon a milkmaid Manika, who gave them butter-milk/yogurt to quench their thirst. Instead of paying her dues, Balabhadra gave her a ring telling her to claim her dues from King Purushottam. Later, Purushottam Deva himself passed by with his army. At Adipur near Chilika lake, the milkmaid Manika halted the King pleading for the unpaid cost of yogurt consumed by His armie’s two leading soldiers riding on black and white horses. She produced the gold ring as evidence. King Purusottam Deva identified the ring as that of Jagannath. Considering this a sign of divine support for his campaign, the king enthusiastically led the expedition. 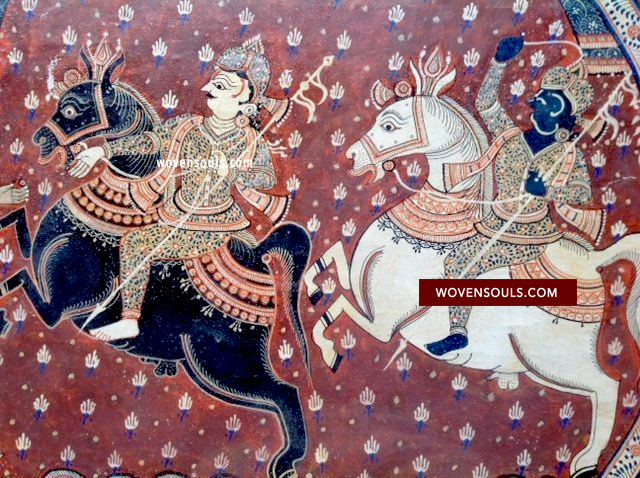 In the war between the armies of Kalinga (inspired by the Divine support of Jagannath) and Kanchi, Purushottam Deva led his army to victory . 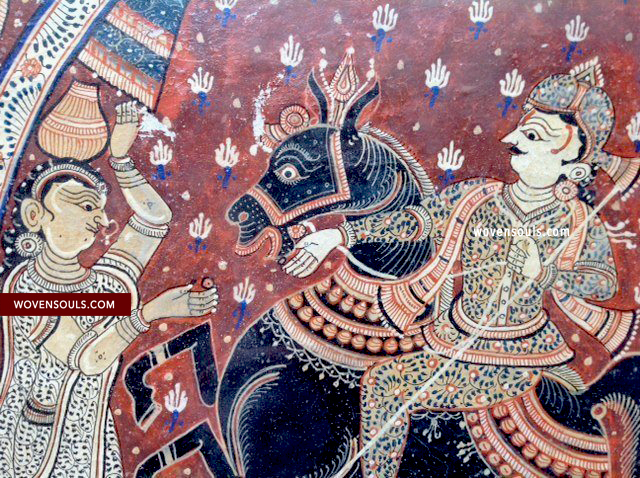 King Purusottam brought back the Princess Padmavati of Kanchi to Puri. To avenge his humiliation, he ordered his minister to get the princess married to a sweeper. The minister waited for the annual Rath Yatra when the King ceremonially sweeps Jagannath’s chariot. He offered the princess in marriage to King Purusottam, calling the King a Royal sweeper of God. The King then married the Princess. This story is mentioned in the Madala panji chronicle of the Jagannath Temple of Puri, in relation to Gajapati Purushottama. This devotional painting depicting the scene of Jagannath, Balabhadra and Manika the milkmaid is estimated to be late 19th or early 20th century. This painting with exquisitely drawn details will now join others in the Puri Patta series. Am waiting to find a way to arrange it alongside these others …. And so, through art, I have once again learned some history! nice.. thank you! I have subscribed to wovensouls and hope to stay connected! Have you written a book? 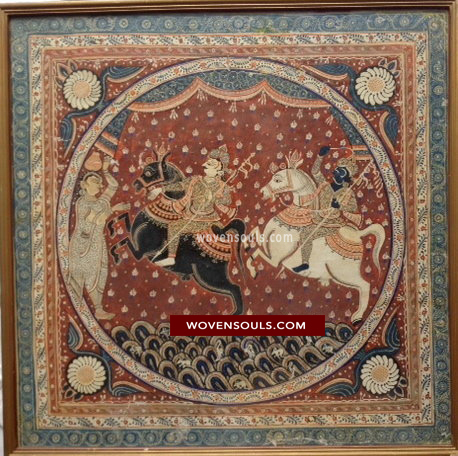 This entry was posted on July 6, 2016 by wovensouls in Art Kaleidoscope and tagged antique Indian, ANTIQUE ODISHA, antique orissa, antique painting, india painting, Indian art, Indian painting, odia art, odisha art, old painting, orissa art, orissa painting, painted legends, Puri, puri patta, vintage India.